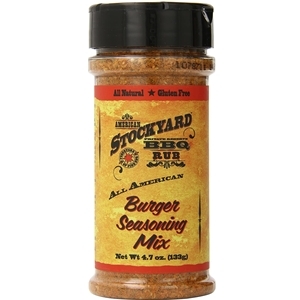 American Stockyard Burger Seasoning Mix is designed to be mixed right in with your ground beef before it goes on the grill. It combines onions, garlic, paprika, sesame seeds and spices to turn an ordinary burger into an extraordinary burger. Just mix 1/4 cup of seasoning with each 1 lb. of ground beef or ground turkey. 4.7oz. Combine ground beef and 1/4 cup of mix. Add salt and pepper to taste. Form into 4 burgers. Broil, grill or fry until done. Dehydrated onion, spices including mustard, sesame seed, salt, yeast extract, dehydrated garlic, parsley, extractive of paprika, silicon dioxide (added to prevent caking).